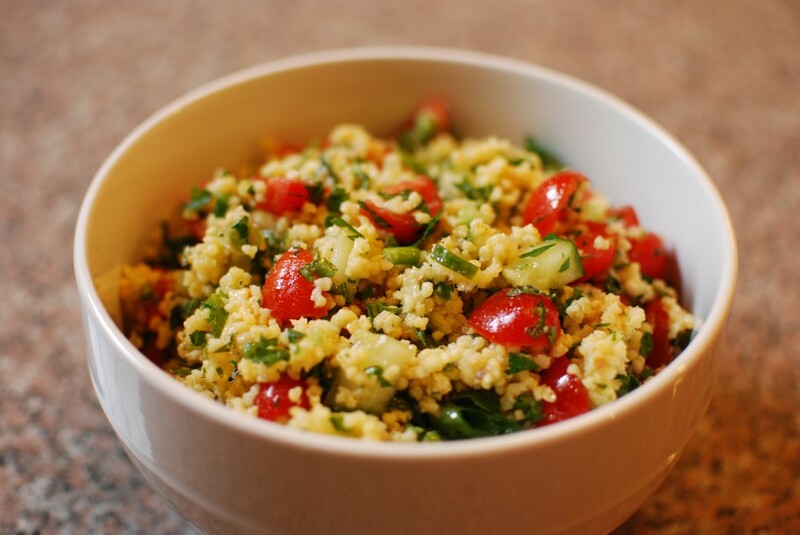 Our love for Middle Eastern food continues with this delicious tabbouleh made with millet berries. We’ve never had millet berries before but it’s kind of like bulgar and cous cous. The kiddos tried tabbouleh for the first time and devoured it! You can easily substitute bulgar or cous cous for the millet. Recipe adapted from War Eagle Mill. Bring 2 cups water and 1 cup of water to a boil; cover, reduce heat to a simmer and cook for 15 minutes or until liquid is absorbed. Uncover and fluff with fork and let cool. Place parsley, mint, cucumber, green onions and tomatoes in a large bowl. In a small bow, stir together olive oil, lemon juice, salt, and pepper. Add cooled millet to bowl with veggies and combine; then add the dressing mixture and toss to coat.